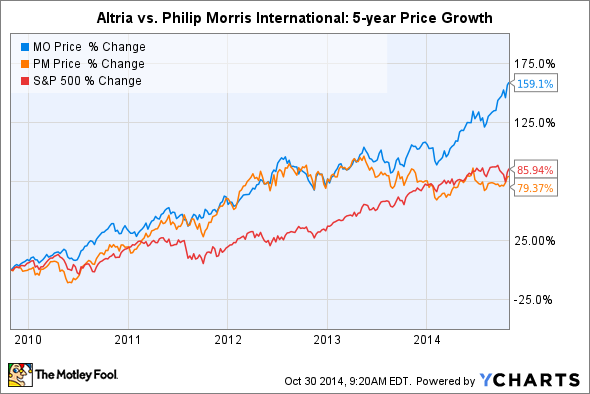 Let’s discuss why Altria is a more solid stock than its overseas counterpart, Philip Morris International. Tobacco stocks, despite their controversial reputation, are well-loved by income investors. In addition to offering big dividend yields often exceeding 4% and a tradition of boosting payouts annually, many tobacco stocks have also outperformed the broad market in the long run. I once owned both Altria and PMI, but I sold all my shares of PMI a few months ago and reinvested some of the cash back into Altria. To date, my Altria holdings are up around 33% -- not bad for a large cap income stock in a shrinking industry. Therefore, let's take a look at why Altria has outperformed PMI in the past, and why I believe it could continue to do so in the future. Before we compare the business outlooks of both companies, we should compare their fundamentals. A basic look at Altria and PMI's top and bottom line performance tells us an interesting story. Source: Yahoo Finance, Oct. 30. Due to Altria's stronger price performance over the past year, it is now trading at a premium to PMI in terms of P/E and P/S valuations. In other words, newer Altria investors are currently paying for more growth than PMI investors. However, Altria's forward P/E is comparable to PMI's, indicating that its past price growth has been fairly reasonable. According to the Surgeon General's Report on Smoking and Health, the smoking rate among American adults has dropped from 42% in 1965 to 18% in 2012. At last count, over 42 million Americans still smoke. Since the U.S. is Altria's core market, it has resorted to three main strategies to streamline its business for a smaller market. First, it reduced its workforce to protect its bottom line. In October 2011, Altria announced that it would lay off workers to cut annual costs by $400 million by the end of fiscal 2013. Over the past three years, it reduced the size of its workforce from around 10,000 to 9,000. Second, it raised cigarette prices to compensate for lower unit sales. Third, it expanded into chewing tobacco, cigars, e-cigarettes, and wine offerings via acquisitions and investments. As a result, "smokeless" products and wine accounted for 9.8% of Altria's top line in fiscal 2013, up from 2% back in 2008. . Although that progress remains slow, it could dramatically speed up over the next few years as demand for its new MarkTen e-cigarettes rises. PMI, on the other hand, faces several different challenges. First, it constantly deals with unstable foreign currencies and a strong U.S. dollar, which reduced its diluted earnings by $0.20 per share last quarter. Meanwhile, sales across Asia, which accounts for 28% of its top line, slumped 12.2% year over year including currency impacts and 4% without. Growth across all other regions remains weighed down in the mid to low single digits by negative currency impacts. That's the key problem with PMI -- investors can't overlook the negative currency impacts because its entire business is based overseas. Meanwhile, Altria investors might see nearly flat year-over-year sales growth, but the results are predictable and immune from currency headwinds and shifting international regulations. 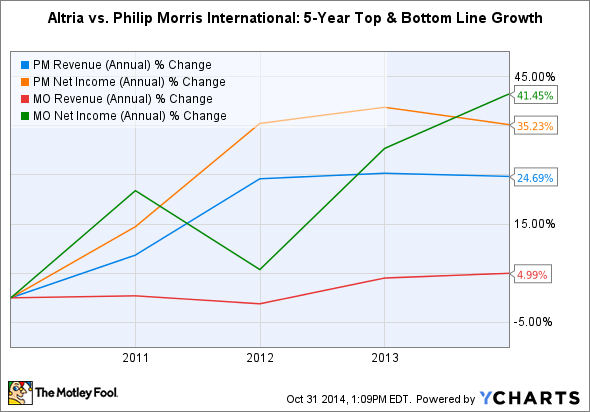 Sin stocks like Altria and Philip Morris International certainly aren't meant for everyone. However, income-seeking investors willing to look past the controversial issues will notice that Altria is a stable income generator which might still be worth a look at 52-week highs. Since most income investors like stable bottom lines in their dividend stocks, Altria's immunity from currency impacts also makes it a more stable and reliable investment than its overseas brother.